A sold out crowd of 2,200 turned out for Motley Crue's roof vibrating GREATEST HITS TOUR. The 80's rockers are here to prove that so-called hair bands are here to stay. With over 35 million albums sold world-wide and having played in front of 25 millions fans it goes to show that what once was, still is and always will be. Playing hits Shout at the Devil, Dr,. 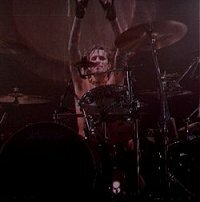 Feelgood, Home Sweet Home, Kickstart My Heart, Girls, Girls, Girls and Smokin' in the Boys Room. They also churned out Bitter Pill and Enslaved from The Greatest Hits CD and crowd favorites Livewire, Primal Scream, Looks that Kill and Don't Go Away Mad Just Go Away. Vince Neil, Nikki Sixx, Mick Mars and Tommy Lee may have shorter hair, but are still louder and prouder than ever. 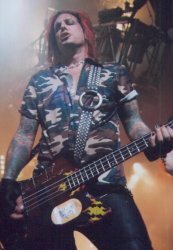 "We have had our share of bumps along the way, but that won't stop us from doing what we do best and that's making Rock and Roll, even If we wanna tear something up or take a few drugs along they way," bassist Sixx tells the captivated crowd. Lee fresh from a stint in county lock-up let god and everyone know how good it is to be free and how he wants the best for his family. Confetti, Confetti, Confetti and fog, fog, fog along with strobe lights and ear piercing rock and roll music gave Ruth Eckerd Hall the test of time. Many more shows will pass through those walls, but none will be the same as that night in December that Crue diehards' once again proved that Rock and Roll is hear to stay and that 40 year old B-day boy Nikki Sixx still has that thundering bass sound deep down inside for many years to come.